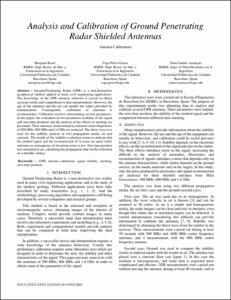 Rasol, M., Perez-Gracia, V., Santos, S. Analysis and calibration of Ground Penetrating Radar shielded antennas. A: International Conference on Ground Penetrating Radar. "2018 17th International Conference on Ground Penetrating Radar, GPR 2018". 2018, p. 1-4.